Genevera I. Allen (left) is professor in the Departments of Statistics, and the Electrical and Computer Engineering, at Rice University. Corinne Cath (right) is a doctoral student at the Alan Turing Institute, the national institute for data science in UK. Below are extracts of recent interviews that are most relevant to our audience. Links to full interviews are provided. I am huge proponent of data science. I think it’s very critical to scientific discussions, and especially important that statisticians are involved. As a discipline (especially in academic circles) we place a preponderance of emphasis on mathematical / statistical rigor and theory; and this often comes at the expense of focusing on the intricacies of the data itself. Data should be paramount and the focus in everything that we do. Rich mathematics and theory are important in statistics, but it should be put in the context of supporting our understanding of data. Specifically, I think that the really important questions in science (that need to be addressed by data) are not addressed by methods that were developed from small, clean, toy data sets, that lend themselves to the assumptions of clean statistical theory. The data sets that are most important, the ones we need to be working with, are big, messy, and complex; they present so many initial statistical challenges that you don’t know where to start. 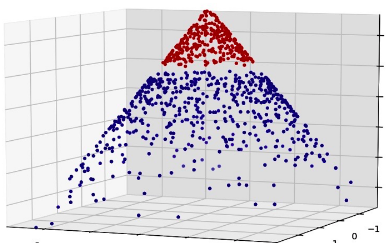 Just because the dataset doesn’t lend itself to beautiful, clean, math to describe the problem, doesn’t mean that the dataset should be ignored. Instead the statisticians should feel encouraged to tackle these complex problems, put data challenges first, and the nice mathematics can follow in its own time. Also, practical, effective, or heuristic methods should not be discarded just because we don’t yet understand all of their statistical properties. If a method is effective, there’s generally a very good mathematical and scientific reason that it is. In this respect, we could be a lot more like engineers and computer scientists because they go out and do things that are useful. I’m a very big proponent of “do something”. Then, we can go back and study the mathematics / theoretical statistical properties of the practical, effective methods. Corinne, few young women take up technology subjects and careers; just 16% of the graduates in computer studies are women and the figure is 14% for engineering and technology*. Why do you think this is the case? I think one of the main problems is – to stay within Internet parlance – that there are very strong institutionalized “memes” about which type of people are expected to excel in what kind of professions. Unfortunately, these memes are often based on flawed stereotypes and prejudices. This holds not just for gender, but also for class, race, and a host of other issues. In practice, it means that for instance girls are often not encourage to the same extent as boys to pursue certain interests or careers at a young age. Over the years this adds up. Not just on personal level, but on an institutional level as well. The challenges and obstacles that women face to access scientific fields vary. Like with most sectors, sexism remains a serious obstacle. But we need to be careful about defining gender equality as the barriers that women face. In my opinion gender inequality can only be tackled when we understand gender as a broad term that includes a variety of gender identities and expressions, and when such gender-based inequality is addressed in tandem with the other forms of structural discrimination like racism, classism, or ableism. The spreadsheet is designed as a tutorial, thought it processes the same data set as the one used for the Python version. It is aimed at people that are not professional coders, people who manage data scientists, BI experts, MBA professionals, and people from other fields, with an interest in understanding the mechanics of some state-of-the-art machine learning techniques, without having to spend months or years learning mathematics, programming, and computer science. A few hours is needed to understand the details. This spreadsheet can be the first step to help you transition to a new, more analytical career path, or to better understand the data scientists that you manage or interact with. Or to spark a career in data science. Or even to teach machine learning concepts to high school students. 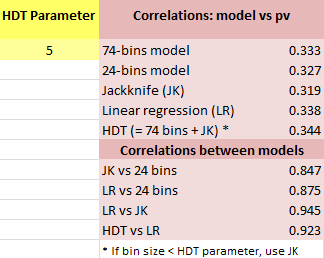 For those familiar with computer science, nodes, both in the Excel or the Python version, are represented here as key-value pairs, typically stored as hash tables in Perl or Python, and as concatenated strings in Excel. For statisticians, nodes are just nodes of decision trees, though no tree structure is used (nor built) in my methodology — and this is why it is sometimes referred to as hidden decision trees (HDT). But you don’t need to understand this to use the methodology or understand how the spreadsheet works. Another way to highlight the benefits is to compare with Naive Bayes. Naive Bayes assumes that the features are independent. It is the workhorse of spam detection, and we all know how bad it performs. For instance, a message containing the keyword “breast cancer” is flagged because it contains the keyword “breast”, and Naive Bayes erroneously assumes that “breast” and “cancer” are independent. Not true with HDT. The data set and features used in this analysis are described here. The spreadsheet only uses a subset of the original features, as it is provided mostly as a template and for tutorial purposes. Yet even with this restricted set of features, it reveals interesting insights about some keywords (Python, R, data, data science) associated with popularity (Python being more popular than R), and some keywords that surprisingly, are not (keywords containing ”analy”, such as analytic.) Besides keywords found in the title, other features are used such as time of publication, and have also been binarized to increase stability and avoid an explosion in the number of nodes. Note that HDT 2.0 can easily handle a large number of nodes, and even HDT 1.0 (used in the spreadsheet) easily handles non-binary features. Page view index (see spreadsheet) is a much better performance indicator than R-squared or correlation with response, to measure the predictive power of a feature. This is clearly the case with the feature “Python”. Jackknife has been used in its most elementary version, with only one M. When the cross-correlation structure is more complex, I recommend using Jackknife with two M’s as described here. 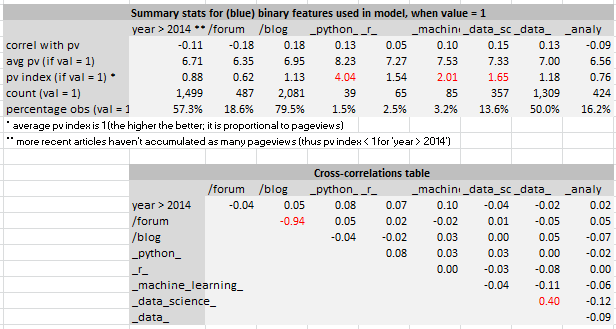 Some of the features are correlated, for instance “being a blog” with “being a forum question”, or “containing data but not data science” with “containing data science”. 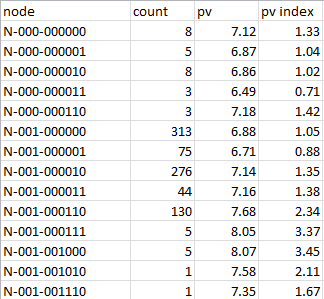 Node N-100-000000 in the spreadsheet has an average pv of 5.85 (pv is the response), and consists of the following pv values: 5.10, 6.80, 5.56, 5.66, 6.19, 6.01, 5.56, 5.10, 6.80, 5.69. The 10th and 90th percentiles for pv are respectively 5.10 and 6.80, so [5.10, 6.80] is our confidence interval (CI) for this node. This computation of CI is similar to the methodology discussed here. This particular CI is well below the average pv — even the upper bound 6.80 is below the average pv of 6.83. In fact this node corresponds to articles posted after 2014, not a blog or forum question (it could be a video or event announcement), and with a title containing none of the keywords from the keyword feature list. The business question is: Should we continue to accept and promote such poor performing content? The answer is yes, but not as much as we used to. Competition is also dropping this kind of content for the same reasons, so, ironically, this is an opportunity to build a monopoly. Also variety is critical, and only promoting blogs that work well today is a recipe for long term failure, though it works well in the short term. 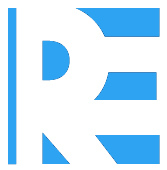 To read my best articles on data science and machine learning, click here.